Resiliency has been the story for these Minnesota Twins early on. Rough innings for pitchers tend to be answered by big innings from the bats. Players are picking each other up. Each loss has been followed by a win. 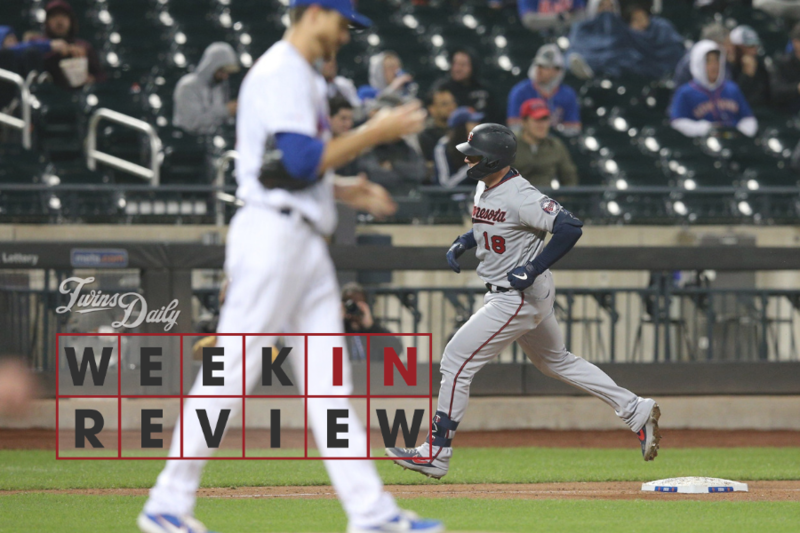 In another short week that was further shortened by rain, the Twins showed plenty more fight. It wasn't a big week for Willians Watch, as our boy collected just one hit in New York and then rode the bench for two games at Target Field, with another righty-swinging backstop stealing his thunder. Still, as of Sunday his .348 batting average ranked 10th among AL hitters with 25+ plate appearances. And it was a strong week for the rest of our trackers above, so let's dig in. With all the Willians Astudillo buzz, Mitch Garver might have been feeling a little slighted. Here's a guy who splashed onto the scene as a rookie in 2018, adapting quickly to MLB pitching and posting an .823 OPS in the second half of his 102 games. And yet, he found himself as an afterthought in the catching discussion this spring, with everyone going gaga for Tortuga. Through Minnesota's first seven games, Garver had drawn only two starts and 10 plate appearances. Finishing the night with four hits, Garver followed on Wednesday with two more, including another home run – this time against elite closer Edwin Diaz. At week's end Garver finds himself with a .500/.522/1.045 slash line. The 28-year-old is just one of those many pieces that makes Minnesota's offensive potential so damn tantalizing. He's got his share of both established ability and ceiling, but is in a spot right now where he has to fight for ABs. There are multiple players on the team (including Mr. Astudillo) in a similar position, and that's a good hell of a good place to be in. After a ho-hum first seven games, Jonathan Schoop turned up the heat in a big way in The Big Apple, launching two home runs in the first game at Citi Field and then adding three hits in the second. We know Schoop is going to have his share of slumps and hacking spells (he went 0-for-7 back at Target Field over the weekend), but his potent presence lurking near the bottom of this order contributes to a minefield dynamic that makes the Twins a nightmare assignment for opposing hurlers. No one exemplifies the lineup's depth better than #9 hitter Byron Buxton, who continues to look very much like the star we've all long dreamed on. Starting all four games for the Twins last week, Buck went 6-for-15 (.400) with three doubles, a triple and another steal. The center fielder has been aggressive and effective, swinging at his pitches and driving them with authority. The tentativeness of 2018 is nowhere to be seen. Through 36 plate appearances on the season, Buxton has only eight strikeouts (22%). That one was appreciated by Jose Berrios, who was on his way to picking up win #2 on his fourth quality start in four tries. Berrios has a 28-to-5 K/BB ratio in 27 1/3 innings, and is throwing 68% strikes with a 12% swinging strike rate. He's been sublime. Michael Pineda is a strong pairing atop the rotation, and looked stellar in his victory over Detroit on Saturday, pounding the zone with 76% strikes and generating plenty of weak contact. The star of the bullpen right now is Trevor Hildenberger. After Blake Parker made a mess in the ninth on Sunday, loading the bases with one out to endanger a two-run lead, Hildenberger came in and struck out back-to-back hitters. In 5 1/3 innings this year, he has allowed zero runs on four hits with nine strikeouts and one walk. Hildy is throwing 70% strikes with a 17.5% whiff rate. During the two-game series in New York, two freshly promoted pitchers from nearby Rochester made their 2019 Twins debuts against the Mets. Both were abject disasters. Chase De Jong's meltdown came in the ninth inning of Tuesday's win, where he entered with a 10-run lead and saw it shrink to six before he was finally able to record three outs. In this single low-leverage frame, De Jong threw 46 pitches, allowing four earned runs on three hits and four walks. Luckily, the score gap was already so large that the right-hander's miserable outing didn't do much damage, other than forcing Rocco Baldelli to start warming up Taylor Rogers, which he surely would've preferred to avoid. The next night, Andrew Vasquez arrived with a louder thud that was much more painful for a couple of reasons. First, it changed the course of a game the Twins had a good chance to win; Vasquez entered with two outs in the fifth, his team leading 1-0, and left with a 3-1 deficit that swelled to 6-1 by inning's end. The second reason Vasquez's catastrophe was so dispiriting is that, unlike De Jong, he actually has a chance to be an impact player for the Twins this year. With Rogers serving as more of a matchup-agnostic setup man and Adalberto Mejia still trying to find his way in the relief role, Vasquez might be Minnesota's best bet for a lefty specialist in the pen. But he's going to have to dig his way out of a major hole following an unimaginably poor 2019 intro. In the rotation, the precision of Berrios and Pineda has been sharply contrasted by Jake Odorizzi and Kyle Gibson, who are really struggling to find their command. On Wednesday, Odorizzi hit a wall in the fifth after cruising early (stop me if you've heard that one before) and saw things spiral once the bullpen stepped in. He has issued seven walks over 5 1/3 innings in his last two starts, and is throwing just 58% strikes this year. Gibson, meanwhile, just doesn't quite seem to have all his strength back and hasn't made it through the fifth in either of his first two turns. With Martin Perez now set to join the starting corps after his own uninspiring and erratic run in the bullpen (nine walks and a 7.56 ERA in 8 1/3 frames), it's time for a few of these guys to step up. There will be no more hiding weaknesses in the rotation or bullpen going forward. The convenience of a break-filled first two weeks is gone, and the Twins must now face the relentless grind of an all-out gauntlet. With only two off-days scheduled in the next five weeks (and a doubleheader mixed in), Minnesota is looking ahead to 37 games in the next 38 days. It's been a good showing thus far from Baldelli's squad, but he's had the luxury of a constantly refreshed bullpen, a deep bench, and a four-man rotation. Now he'll really start getting tested, especially on the reliever front here he must to identify reliable relief arms Rogers, whom the manager has leaned on heavily with seven appearances (and another warm-up, thanks to De Jong) through 12 games. That kind of usage will be infeasible from now on. The most important name to watch right now – especially with pertinence to the struggles of bullpen call-ups mentions above – is Fernando Romero. His week with the Red Wings saw one excellent outing, when he tossed 3 1/3 scoreless innings with four strikeouts on Tuesday and one brutal one, when he yielded four runs on three homers over 1 1/3 innings on Saturday. Romero has managed just a 9% swinging strike rate through his first three appearances in Rochester, which is concerning. The idea was that he'd be dominating in this role. One pitcher who was not on the preseason top-prospect radar but is quickly demanding attention: Devin Smeltzer, the 23-year-old left-hander acquired alongside Luke Raley and Logan Forsythe in last year's Brian Dozier trade. After a masterful second start for Pensacola, he has now thrown 14 total innings with zero runs allowed on five hits (all singles) with 17 strikeouts and two walks. It doesn't get much better than that. Smeltzer is quickly establishing himself as one to watch. The Twins' vaunted minor-league bats have mostly been slow to go. Royce Lewis had his first multi-hit game on Sunday, raising his average at Fort Myers to .206 with a pair of singles, but he has offset his lack of hitting with tremendous discipline. Lewis sports a .404 OBP, thanks to a 12 walks (against only seven strikeouts) in 10 games. . Trevor Larnach's OPS with the Miracle sits at .666 even after he collected three knocks on Sunday. Brent Rooker has a ghastly 18-to-2 K/BB ratio in 40 plate appearances for Rochester. Alex Kirilloff remains sidelined, with little clarity on his return. The Twins have a full slate ahead next week, and as we've established, that's about to become the norm. They open with a four-game home set against the Blue Jays, who've historically tormented them at Target Field, before swinging out to Baltimore for three games against a very bad Orioles club. Hoping TF isn’t the cure to the Jays road woes. 11-5 would look pretty damn good. Particularly with the tribe facing HOU SEA ATL in 14 of their next 19. Trevor Larnach's OPS with the Miracle sits at .666 even after he collected three knocks on Sunday. Heard on pregame that Wander Javier was close to ready and Kirilloff right behind. I have my concerns with this team and I think some of our pitchers are going to get exposed soon (I see Perez flopping big time in the rotation, the bullpen isn't ready for high leverage situations in back-to-back days, can we trust Mejia/Harper/Vasquez in tight situations?). But this lineup looked good on paper, and it's translating. Garver and Buxton are hitting better than I've expected, and it seems Castro is basically the backup catcher at this point, which is good, especially for depth. The next 7 games are against two pretty bad teams... I'd like to see them go 5-2 and start building a lead for the division. And I hope we can see some more development of our AA/AAA guys so we'll have some reinforcements later in the year. I'm not super encouraged by the progress of some of the prospects so far, and some need to get healthy. The good thing is that it's still early, and things can change pretty quick. We are about to find out if this team has the pitching to contend. 37 games in 38 days is a lot to ask, and I think the shallow bullpen is about to get exposed. We do need two of the three to step up or we will be having bullpen burnout. My guess is that if Perez can get the Twins though four innings, the game will be handed over to Harper and Mejia, but the problem is that they cannot do that three times in a row if none of those three starters can step up for six or more innings. So far the story of the off season has continued to tthe story of the season: the Twins have what looks to be an explosive lineup top to bottom that could challenge the Indians in a weak AL central--making their refusal to dip into the loaded free agent market for relievers except for one bargain basement closer completely inexplicable. I know their plan is to invest in bullpen help via midseason trades if they prove they can stay competitive, but by then it may be too late. The bullpen has already blown two winnable games, and looked scary in a couple more, and it's not even mid-April. Six games by mid-season could cost them the division. I know every bullpen blows a game now and then. But it's not normal to gift seven free passes in a row. And yes I'm counting Odorizzi's contributions, because with a deeper bullpen he wouldn't have been left in that long. I And yes I'm counting Odorizzi's contributions, because with a deeper bullpen he wouldn't have been left in that long. There's a fair possibility of a rainout on Wednesday. Possibly a good time to skip Odorizzi in the rotation and get him "fixed" on the sidelines and/or a game in rellef before his next scheduled start? The Jays and the Orioles this week... They should be able to rack up some wins. This lineup is incredibly potent. If Sano comes back strong we're probably top 5 imo. The rotation currently is Pineda and Berrios and pray for snow. Gibson isn't quite in 2018 form yet but I have faith in him. Odorizzi could use and opener. Perez could use 2. This bullpen would look really good to me with another plus arm. Are any of those available that wouldn't cost any prospects? Maybe a bearded one with World Series experience. Hopefully the Twins can take advantage of a weak schedule this week. Really need Gibson and Odorizzi to step up. I think Perez could look good in the bullpen. It doesn't make sense to me that the Twins have had 5 off days (plus a postponement) to begin the season and are now playing 37 games in 38 days. Why couldn't some of those off days be distributed throughout the season? Plenty of people here weren't sleeping on Garver. If anything, the opposite. and it seems Castro is basically the backup catcher at this point, which is good, especially for depth. I have to believe that this was always the plan, when the 3-year contract was signed. Plans rarely work out exactly, and the injury ruined the second year of this particular plan, but it's nice when the overall intent seems to pan out. I'll admit I have La Tortuga fever and I dismissed Garver a little bit because he had such a down spring.I know spring doesn't mean much but it had me wondering if he was regressing.Happy to see my assumptions were wrong. Agree that 'hiding' the bullpen is about to get much harder...irregardless of level of competition. Offensively, you can tell there's an obvious intent to be more aggressive and swing earlier in counts this year. Twins are dead last in baseball in pitches per PA. Swinging before you have two strikes has helped the K%, and hurt the BB%...as you would expect. (Still have a relatively high team swinging strike rate.) This hasn't hurt overall production so far thanks to extra-base hits and a pretty high (unsustainable?) team BABiP of 320. We'll see...but it does seem funner to watch. At least as long as the results remain favorable .